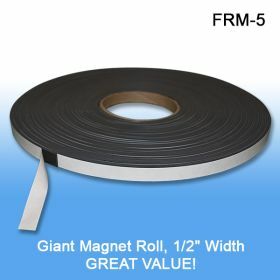 Minimum quantity for "Peel & Stick Magnets on a Roll, 240/Roll, 1/2" Wide x 5" Long x 1/16" Thick, FRM-5" is 1. Clip Strip Corp. magnets are made of the highest quality magnet and adhesive available. It is very strong and will last the test of time. Our FRM-5 is made for indoor uasge and the roll is pre-cut every 5" for ease of use. If you want a smaller slice just cut it further with any standard scissor. Just peel and stick the adhesive side to clean, flat surfaces and use the magnetic side on any metal surface. 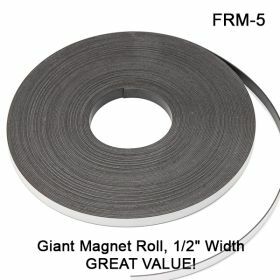 Our adhesive magnet is great for shelf talkers and signs. You can also create magnetic shelf dividers by attaching this product to our adhesive shelf dividers and then to a metal store fixture. If you are in need of other magnet sign holders, check out our magnetic sign holder section here.